This game was billed as a low scoring, physical and heated battle between two bitter rivals, but it didn’t really turn out that way. The edginess was there, but the Rangers (8-2-2) seemed to effortlessly cruise past the Washington Capitals (8-3-0), ending the Caps’ four game road winning streak and extending the Rangers personal win streak to three games. The Rangers came away with a 5-2 victory in an entertaining and tense contest, with five different goal scorers helping them claim sole possession of first place in the Metropolitan Division. The Blueshirts have won three in a row, but they have now earned at least a point in seven consecutive games, going 5-0-2 in that span. Under head coach Alain Vigneault, the Rangers have been known as road warriors, but they are now 6-1-1 under the lights at Madison Square Garden. The Rangers eight wins and 18 points are tied for the fourth-most wins and points that the team has posted in the first 13 games of a season in franchise history (Courtesy of @NYRangers on Twitter). The opening period didn’t disappoint in energy, scoring chances and saves. The action was plentiful early, with Alex Ovechkin manhandling Marc Staal on the forecheck and backhanding a puck on net, but also nearly took Staal’s head off in the process. 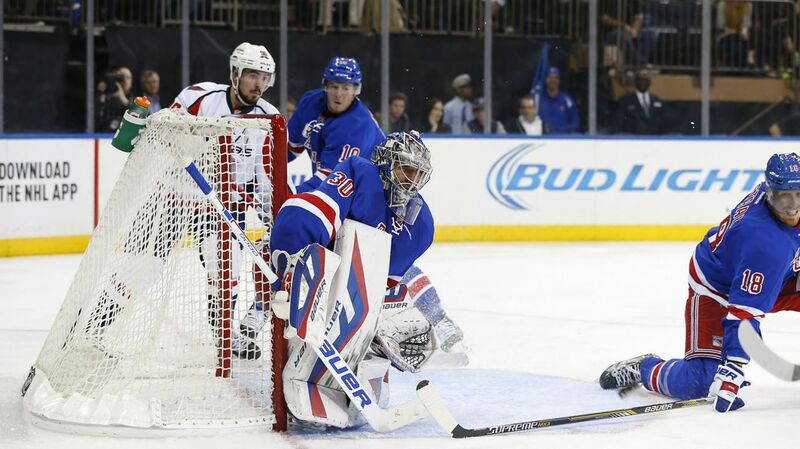 Shortly after that, Chris Kreider had a clean breakaway, but was denied by the right pad of Braden Holtby. The Rangers would break through first just 7:59 into the first period. After chipping the puck into the zone, Kevin Hayes hustled to collect it behind the net, centering it to Dan Girardi. He fired a quick shot that deflected off of Viktor Stalberg and was loose in the crease. Hayes passed it off to Lindberg, who was cutting to the net. Lindberg tapped it past Holtby for his sixth goal of the season. The Rangers were a bit fortunate on this play because the referees didn’t see Staal spear Ovechkin before the play, likely a retaliation for Ovechkin’s forechecking earlier. Ovechkin was incensed, and took that anger out in his play. After Dan Girardi struck the post with a wrist shot, the Capitals quickly transitioned down the ice, and Nate Schmidt backhanded a puck to Ovechkin for a one timer, tying the game with less than five minutes to go. The Rangers wasted no time getting their lead back, re-taking the lead just 2:01 after Ovechkin scored. Kevin Hayes scored this goal, giving him points in four of the last five games, totaling five points in that span. Marc Staal passed the puck off the boards as a Capital was trying to pinch in on him, leaving Hayes wide open at Washington’s blue line. Hayes looked over to Viktor Stalberg, but took the shot himself, shooting it off of Holtby’s glove and into the net. Oscar Lindberg picked up the other assist. New York had their lead back heading into the locker room, playing a pretty strong opening period. The Rangers managed to play a terrible second period, yet come away with two more goals and a two goal lead, getting outshot 14-2 in the process. The Capitals had a ton of zone time and space to make plays, but Lundqvist and the defense stood tall. The period started off with New York killing off what was left of Dan Girardi’s hooking penalty. 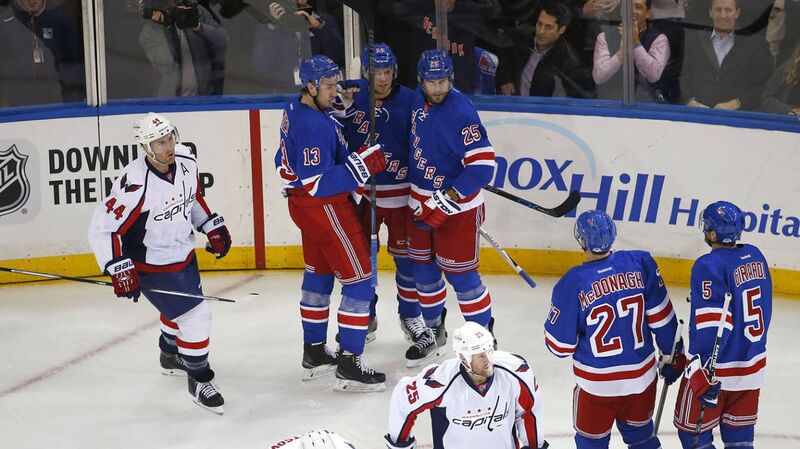 After the penalty expired, Ovechkin mishandled the puck in the offensive zone, leading to a Rangers 4-on-2 rush. 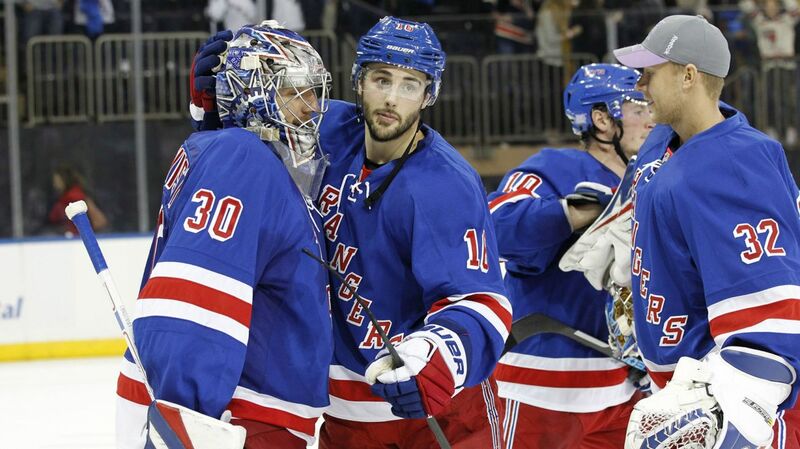 Brassard dumped it off to the trailing Kevin Klein, and his wrister found twine for his third goal of the season. Six minutes into the period, things got dicey for the Rangers. They were pinned back in their own zone for 1:40 straight, and JT Miller made some excellent plays to shadow Ovechkin and defend without a stick. After Vigneault called a timeout to rest his tired players, the Rangers got their top line on the ice and scored again, just their second shot of the period. Zuccarello passed the puck to Brassard, and he tried to feed Rick Nash for an easy tap in, but it deflected off of Marcus Johansson and into the net. Johansson would get the goal back. The Capitals had a ton of time to pass and set up a shot, and a well-placed wrister put the Capitals within two goals. Dominic Moore nearly scored on a deflection as time expired, but the puck went into the net about 0.3 seconds after the horn had sounded, the Rangers lead remained at 4-2. The third period was mostly the same story, with the Capitals having the majority of the puck possession, lots of open ice and plenty of opportunities. However, thanks to Henrik Lundqvist and some good defending, nothing came from it. The Rangers managed to score their fifth goal of the game on just their 17th shot, and it was Jarret Stoll finding the back of the net for the first time as a New York Ranger. Keith Yandle passed the puck off to Stoll, and he hammered home a slap shot that seemed to deflect off of something, dipping and beating Braden Holtby. Overall, this was a really ugly win, but a win nonetheless. When the Rangers can go into hibernation for the last 40 minutes, get outshot 34-21 and still score five goals and win, it shows how good they are. This was an off day for them. Imagine them on a good day! For the most part, every forward and defenseman was atrocious possession wise. But the third line, consisting of Oscar Lindberg, Kevin Hayes and the newly returned Viktor Stalberg absolutely dominated the Capitals in this game. 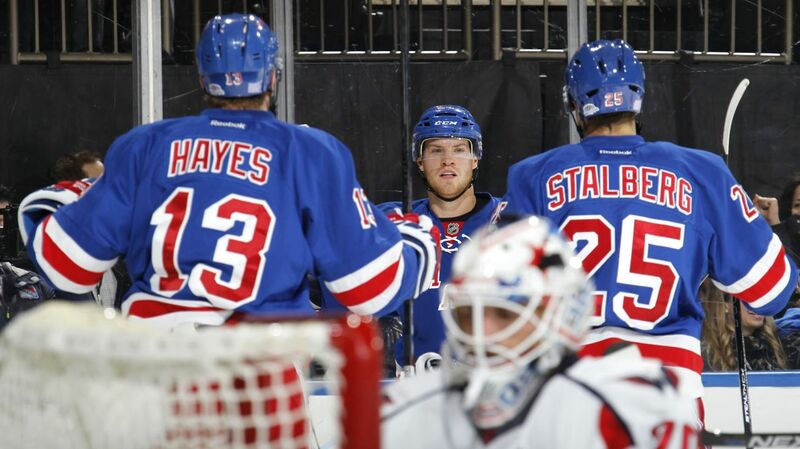 Kevin Hayes and Oscar Lindberg both had a goal and an assist, and Stalberg picked up a helper. Lindberg had six hits, and the amount of pressure and scoring chances these three created was impressive. The Hayes line combined for an astounding 67.81 corsi for percentage. The rest of the Rangers combined for a 28.74 corsi for percentage. Hayes, Lindberg and Stalberg were phenomenal. Photo courtesy of MSG Photos. This season, Hayes now has eight points (3-5-8), while Oscar Lindberg is tied for second on the team with nine points (6-3-9). Lindberg has the most goals amongst all rookies, fourth in total points, and second in plus/minus (+8). While Derick Brassard didn’t have a great game possession wise, he was still quite effective in this game. Brassard won six of the eight faceoffs he took and notched a goal and an assist, placing him atop the scoring leaderboards with four goals and six assists. He has seven points (3-4-7) in the last four games alone, and he’s really starting to heat up, as well as get the top line clicking again. Kevin Klein continues to make me look like an idiot for my preseason claims, playing another solid defensive game and also picking up a goal and an assist. Klein now has three goals this season, and continues to be a scoring threat while also being the most consistent player in his own end. I was very happy with Dylan McIlrath tonight, and I was very happy with how Vigneault used him. McIlrath logged 19:50 of ice time, just 1:03 behind Ryan McDonagh, and he saw some tough assignments. But he handled them very well. Washington’s size wasn’t a problem at all for him, and the fact that he was matched up against guys like Alex Ovechkin and Evgeny Kuznetsov didn’t matter. McIlrath handled himself very well, finished with a +1 rating, a blocked shot and four hits. I feel like I don’t need to write this because it’s the story line of every game, but Henrik Lundqvist was really freaking good, again. The team leaned heavily on him in the last two periods, and he responded with 32 saves. In his last 13 games against Washington, Lundqvist is 10-2-1 with a 1.76 GAA, a .935 save percentage and three shutouts. For this season, Henrik is 6-2-2 along with a 1.88 GAA and a .943 save percentage. Posted on November 4, 2015, in Game Recaps and tagged Alain Vigneault, Alex Ovechkin, Braden Holtby, Chris Kreider, Dan Boyle, Dan Girardi, Derek Stepan, Derick Brassard, Dominic Moore, Dylan McIlrath, Emerson Etem, Jarret Stoll, Jesper Fast, JT Miller, Keith Yandle, Kevin Hayes, Kevin Klein, Marc Staal, Mats Zuccarello, MSG, New York Rangers, New York Rangers blog, NHL, NYR, Oscar Lindberg, Rangers, Rangers blog, Rick Nash, Ryan McDonagh, Stepan overtime goal, Viktor Stalberg, Washington Capitals. Bookmark the permalink. Leave a comment.